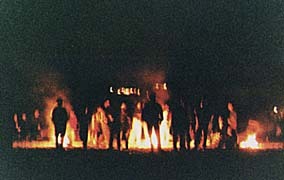 Chahaarshanbeh Souri, Santa Cruz beach, California. A group of us gathered at the beach in Santa Cruz last night -- Tuesday, March 18, 1997. Here's a closer look. Local park rangers had given permission to light fires for Chahaarshnbeh Souri from 8 to 10 at night. The rangers showed up promptly at 10, telling us through a loudspeaker in their jeep to turn out the fire. No problem. It was fun. Jaaye hamegi khaali, as they say (should have been there; we missed you). By the time Farzaneh and Firouzeh Rohanizadeh and I got to the beach, the fires had just been lit and the jumping was well under way. There were about 30 of us, mostly between the ages of 20-30. We couldn't resist screaming every time we jumped over the fire. And when everyone had their second and third run, it was time for some clapping and dancing . The girls danced, the men clapped. The favorite song seemed to be Sandy's banadri tune, "Dokhtar Ahvazi" (Ahvazi girl). And then Mehrdad Nejat got out his drum and played some bandari. Earlier that day his wife, Fariba Nejat, had succeeded in convincing the Santa Clara County to recognize March 21, 1997, as Iranian Heritage Day. Curiously, there was not one mention of Iran, by anyone at the beach. Do you have a story to tell about Chahaarshanbeh Souri or Noruz in your community? Any interesting memories from back in Iran? You are welcome to submit. I was soaking up the sight and the sounds when I was interrupted "Fandak daareed?" Thousands of Iranians converge in one park. On the disbanding of an Iranian community group. What is Noruz? Haft seen? Sizdah Bedar? Iranians in Washington DC want baked goods for the holiday, and the Yas Bakery is famous for making the real deal.